You are probably right, Marie, my husband likely developed stretch marks on his buttocks during a youthful growth spurt. I asked him if he remembers when he got them, but he says he does not recall when they formed. Naturally, as the years pass on, they seem to become somewhat more noticeable. Truthfully, if I could just have a few stretch marks instead of sort-of-loose adipose tissue and stretch marks, I'd take it! LOL. Cher, I suspect your husband had stretch marks on his buttocks for some time, but they were probably faint, so they were not nearly as visible. Naturally, skin ages as the years pass, so the marks became more obvious with the passing of time (at least I know that is what happened with me). Allan, I believe that tretinoid 0.05% and vitamin C serum are an effective combination to boost elastin and collagen in the skin. 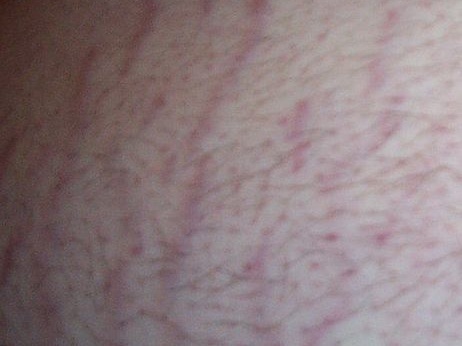 When used regularly, stretch marks will soften. Cocoa butter is great to use as a preventative measure and might even help existing ones.Anyway, I hope these suggestions help. I used to think that stretch marks were primarily a female condition because of pregnancy and hormonal changes, but my husband has some minor marks, as well. Even though his weight has been mostly stable since we met many years ago, he has formed stretch marks around his underarms and buttocks. Interestingly, the one area that tends to accumulate weight, his stomach, appears free from these univited visitors. Why would his otherwise unblemished buttocks develop stretch marks and his more fleshy stomach be devoid of them? 1. have you considered wearing those Under Armour shirts - the kind that make you look really ripped? Plus they have the added benefit of helping to protect against sunburn. 2. Beyond that there are some really effective treatments these days for stretchmarks in men that you might consider. I'm a 27-year-old man with stretchmarks. I'm actually quite skinny now, but I was heavy growing up, particularly in grade school and junior high (did the whole fat camp thing three times). I actually weigh less now than I did in junior high, which is pretty amazing considering how much taller I am. I have stretchmarks on much of my body, but they're most noticeable on my stomach and back, and it's ridiculously embarrasing. I remember as a kid not wanting to swim without a shirt because I was embarassed by how fat I was, and now I'm embarassed to swim without a shirt because I don't want people to see the stretch marks. Considering how much work I put into getting skinny, I'd like to be able to show it off by strutting around without a shirt every once in awhile. A place for men with stretchmarks to discuss their experiences.